The parties have now registered their candidates and policies with Latvia’s Central Electoral Commission. There is less than two months until the elections and neither expense nor political tricks are being spared. The resulting noise is confusing to the onlooker, so this article attempts to strip away the hype and give an objective and critical view of the party candidates and their policies. Another point to consider is that Latvian governments have traditionally been coalitions, as no one party has ever held enough seats to form a government alone. For this reason, the leader of the government is necessarily a figure of compromise and is unlikely to be the official leader of any of the parties forming the coalition. Bear in mind also that the Latvian voting system allows for a party ballot paper to become essentially a vote for one individual, if a plus sign is marked against that individual’s name and all the other candidates on the ballot paper are crossed out. Candidates that promote this style of voting are not likely to support their party’s views, but rather their own self interest. Finally, be aware of ambiguities in the party names, as some parties have deliberately created a name similar to an existing party. For example, “Par Alternatīvu” is not the same as “Attīstībai/Par” and “Latviešu nacionālisti” is not the same as Nacionālā apvienība “Visu Latvijai!”-”Tēvzemei un Brīvībai/LNNK”. Voters should be very wary, as even a few votes may be crucial to the success of some parties. First, a few general points, then the specifics of the Riga area candidates, which will be the ones on the ballot papers for overseas Latvians. A reminder that we are only looking at those parties that are likely to poll over 2%. (According to current ratings figures). Each party’s candidate list has a mix of veteran and virgin politicians – some weighted more in favour of political experience, others in favour of fresh faces. Parties which have opted to essentially retain their veteran politicians in the front line-up are: Nacionālā apvienība “Visu Latvijai!”-”Tēvzemei un Brīvībai/LNNK” (NA) and Zaļo un Zemnieku Savienība (ZZS). The once leading party “Vienotība” has become “Jaunā Vienotība” and in at least two areas it is leading its ballot paper with experienced government ministers. “Jaunā Konservatīvā partija” (New Conservative Party) is not really all that new, but in this election seems to have a chance to enter the Saeima. Its drawcard is that at least two of its ballot papers are led by respected anti-corruption campaigners Juta Strīķe and Juris Jurašs. This party also polled well in the Riga local elections. KPV.LV (short for “Kam pieder valsts” which translates as “Who does the country belong to?”) is aggressively putting itself forward, despite an almost total lack of political experience by any of its members. Its leader, Artuss Kaimiņš, has gathered a mixed bunch of strident candidates around himself. The liberal, pro-western niche is this time occupied by “Attīstībai/Par”. Although the party styles itself as being young and fresh, its front runners are experienced politicians. This party also has a fair sprinkling of high profile arts identities. The ballot papers issued for Riga are tailored to suit the citizens of Riga and the Diaspora. The average Riga citizen has a higher income, is better educated and has a more global outlook than the average regional citizen. At the same time, the citizen of Riga is also more suspicious and inclined to change his or her mind. An example of this tailoring is that the front candidate in Rīga for “Saskaņa” is Vjačeslavs Dombrovskis, a highly qualified economist with a doctorate from Clark University and ministerial experience. However, the other candidates on their list are not well known to the Latvian public, apart from the widely disliked “family values” proponent Jūlija Stepaņenko and defence expert Raimonds Rublovskis. “Saskaņa” has also included one of the Rubiks sons in its Riga line-up. In contrast, the ZZS ballot paper for Rīga is full of well-known and respected candidates, beginning with Dana Reizniece-Ozola (Finance Minister and U-18 European chess champion) and ending with the Head of the Academy of Arts and Sciences, Ojārs Spārītis. The NA candidates are also well-known, including Dace Melbārde (Minister for Culture), foreign policy expert Rihards Kols and Professor Dagnija Blumberga. 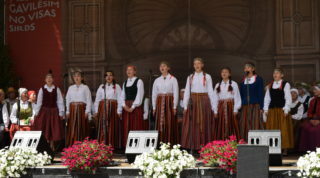 “Jaunā VIENOTĪBA” is headed by Foreign Minister Rinkēvičs, who is supported by well-known and experienced politicians, such as Ojārs Ēriks Kalniņš, Interior Minister Rihard Kozlovskis and Education Minister Kārlis Šadurskis. JKP has chosen Juta Strīķe to head their list. She has had a high profile since 2003, with her first candidature for KNAB (the anti-corruption organisation). Their list includes economist Gatis Eglītis and well-known administrator Indulis Tupenis. The candidate list of “Attīstībai/Par!” begins with Economics Minister Daniels Pavļuts and includes former minister Vita Anda Tērauda, anti-corruption experts Inese Voika and Kristaps Petermanis and other familiar faces. In contrast, KPV.LV has assembled a surprising array of characters, including singer and TV personality Andris Kivičs, actor Ivars Puga and Fisheries Union president Didzis Šmits. In short, the party candidates offer a broad spectrum of knowledge, experience and political history. Voters should consider carefully the rival merits of experience/youth, education/popularity, strong patriotism/a global outlook, etc. It is clear that newcomers to politics will have a cleaner reputation than those who have already been there for some time. However, a well-educated politician does not necessarily have the skills to be promote his or her policies and previous business experience may be an indicator of either links with corrupt practices or a deep understanding of Latvia’s economic problems. The simplest way to gain some clarity on the issue is to look at the past achievements of the candidates and parties. Over 4,000 programs have been registered by the competing parties. The programs are not of themselves generally considered as important campaign elements. However, it is a good idea to cast your eye over them, to gain some insight into how the party perceives its voting support base. Some are written in plain language, outlining aims, objectives and strategies, while others are couched in flowery language, big on hype and devoid of strategic substance. It should be remembered that for a party to enact its policies, it is not enough for it to gain seats in the Saeima, it must negotiate successfully with the other members of government. Here again, the best indicator of future achievements is past performance. The popularisation of Artuss Kaimiņš’ party KPV.LV has led to the concern that there may be a real possibility of a future coalition government with “Saskaņa”. “Saskaņa” has such a different position to the vast majority of the parties on Latvian language, history and geopolitical orientation that this concern is understandable. KPV.LV has until now been unpredictable in its political decisions and has not made any firm commitments, so there can be no certainty that it would not invite “Saskaņa” as a coalition partner. This seems a very remote possibility, as the right-wing parties that are likely to win places in the Saeima (according to the current ratings, see below) have all ruled out forming a coalition with “Saskaņa” and some of them would need to be part of such a coalition, to get the voting mandate above 50%. Another point to remember is that the President has the power to invite a party representative to negotiate a coalition to form a government, the party with the largest number of votes does not automatically gain this privilege. It would seem that the current Latvian President Vējonis has enough political sense not to invite “Saskaņa” to form a government. If KPV.LV were invited to form a government, there would be immense community opposition to “Saskaņa” being involved. Whoever is invited to form a government, it will be difficult to negotiate a workable coalition. There is a greater likelihood that the right-wing parties will set aside their differences and form a government if the only alternative is inviting “Saskaņa” to the table. If such a coalition should be unattainable, the majority of right-wing parties would opt for an extraordinary election rather than a government that included “Saskaņa”. The relative strengths of the parties in the next Saeima is critical in all of these scenarios. So, more than ever, not only does every vote count, but it can be crucial to the entry into the Saeima of the minor parties that are hovering around the 5% mark. It is also important that people of differing political views talk to one another: the plethora of small political parties is symptomatic of a fragmented Latvian society, each shard isolated from the others. It is not always easy nor pleasant to speak with people who hold radically different political views. The alternative is to complain after the elections of a duplicitous government with policies at odds with Latvia’s interests. Šķiet, šie vārdi visprecīzāk stāsta par “Atbalss” ceļu uz Latviju un Dziesmu svētkiem. Idejas aizmetnis par to, ka bērniem jāpiedalās simtgades Dziesmu svētkos radās jau pirms gada. Ar sirdi jūti, ka jābrauc, ar prātu saproti, ka viegli nebūs. Bet sirds bieži vien izrādās stiprāka par veselo saprātu. Jābrauc! “Atbalsij” paveicās ar to, ka Latvijas Republikas Ārlietu ministrija atbalstīja Dziesmu svētku pieteikuma projektu, līdz ar to nebija jādomā par ceļa izdevumiem. Atlika tikai nokārtot dokumentus, t.i., ceļošanas pasi, vīzu un vecāku atļauju par bērna izceļošanu ārpus Krievijas. 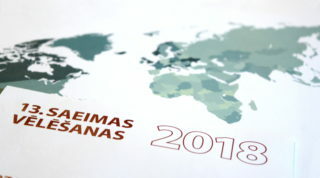 Latvijas Republikas vēstniecība Krievijā vīzu uz Latviju skolēniem izsniedza bez maksas. “Atbalss” ceļojums uz Latviju sākās ar Latvijas vēstniecības Krievijā apmeklēšanu un tikšanos ar Latvijas vēstnieku Krievijā Māri Riekstiņu. No Ufas līdz Rīgai skolēnus “pavadīja” režisors Renārs Vimba, kurš vāca materiālu īsfilmai par to, kā “Atbalss” gatavojās Dziesmu svētkiem. Latvijā skolēni lielākoties uzturējās Liepas pagastā. Bērni dzīvoja viesģimēnēs. Nedēļas laikā viņiem bija iespēja ceļot pa Latviju. Par to liels paldies jāsaka Liepas skolas skolotājai Inesei Lācei, kura Baškīrijas bērnu uzņemšanu organizēja jau otro reizi. “Atbalss” koncerts Liepā pulcēja kopā lielu daļu to latviešu, kas savulaik no Baškortostānas pārcēlās uz Latviju. Pēdējo gadu laikā no Baškīrijas aizbraukušie latvieši ir atbalstījuši skolēnus, kas Baškortostānā apgūst latviešu valodu, gada beigās piešķirot vienreizējo stipendiju uzcītīgākajiem latviešu valodas apguvējiem. Šis brauciens nebūtu iespējams bez skolēnu vecāku atbalsta un vēlēšanās dot saviem bērniem iespēju apmeklēt Latviju. Diemžēl ne visi vecāki uzskatīja par vajadzīgu savu bērnu palaist uz Latviju vai uzskatīja, ka izbraukt ārpus Krievijas, piedalīties Latvijas simtgades svētkos ir pietiekams iemesls, lai papūlētos noformēt ceļošanai nepieciešamos dokumentus. Dziesmu svētki ir pagājuši, “Atbalss” Latvijā ir pavadījusi piesātinātu, notikumiem un iespaidiem bagātu nedēļu. Šī nedēļa nebūtu iespējama bez Latvijas vēstniecības Krievijā, Liepas pagasta un Priekuļu novada pašvaldības, Liepas pamatskolas atbalsta. Bērni noguruši, bet laimīgi devās mājās, un man gribas ticēt, ka šī nebūs vienīgā reize, kad viņi apciemos Latviju, savu senču zemi. Latviešu valodas un kultūras skolotāja darbību Baškortostānas Maksima Gorkija ciemā finansē Latviešu valodas aģentūra no valsts budžeta. 2018. gadā latviešu valodu skolotājas Ilonas Saverasas vadībā apgūst 19 skolēnu, bet folkloras ansamblī “Atbalss” aktīvi darbojas 16 bērnu.